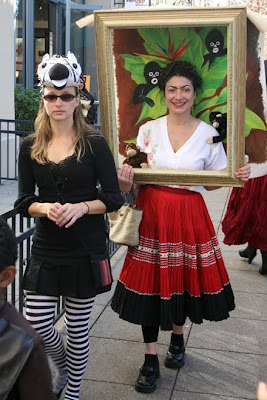 I made a little video of Halloween on Pacific Avenue for my YouTube channel: chelseamaya. 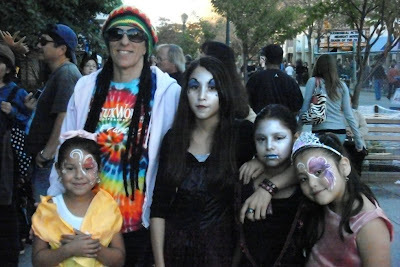 Halloween was pretty mellow. 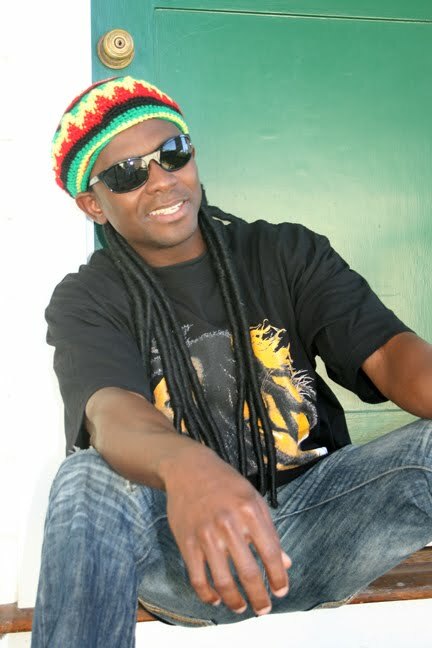 Andre worked from 3 p.m. to 3 a.m. as a security guard on Pacific Avenue, so I borrowed his rasta cap with dreds and sunglasses to walk around and check out the scene. 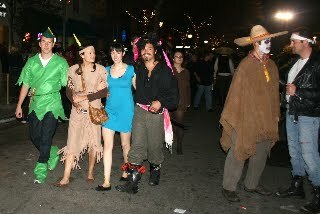 Santa Cruz had braced itself in advance for the onslaught of local and out-of-town revelers who parade up and down the avenue each Halloween. Plastic wrap protected the trees and plants, portable chain-link fences prevented cars from entering the avenue, cops and private security guards from surrounding areas joined the local forces, and the cost of being drunk-in-public tripled. To top it off, a helicopter circled the downtown all night long, keeping a lot of neighbors awake till past midnight. Compared to other years, this was a quiet one with an estimated crowd of 20,000 and no violence, much to Andre's relief. I popped down in the afternoon and after dark to photograph and video tape and to say hi to Andre. Mostly I stayed at home and waited for the scarce trick-or-treaters. 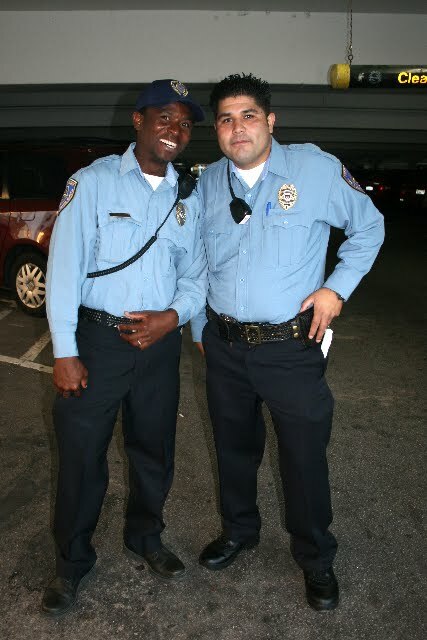 Andre and a co-worker for 1st Alarm. 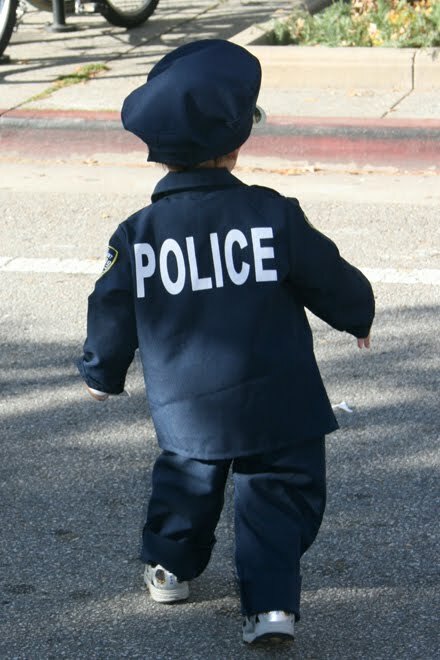 A future police officer also patrolled the streets. 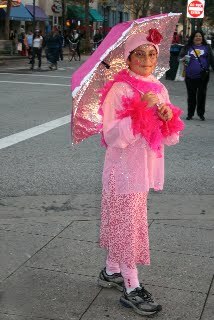 A tribute in pink to the Umbrella Man of Santa Cruz. 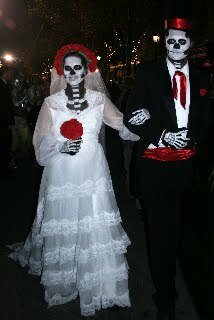 A Day of the Dead couple. 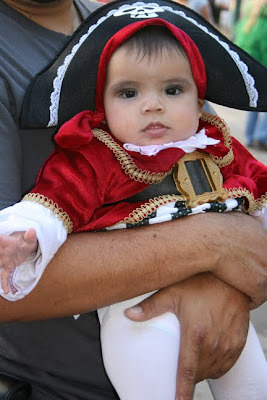 My favorites were this little pirate and a creative portrayal of Frida Kahlo.